Christmas wishings, in fancy Photoshop format! I purchased Photoshop with some birthday money a couple of months ago and finally have had a chance to use it. To celebrate Polyvore style, here are some lovely things I'm longing for this holiday season. Tapestry and brocade prints. This ASOS rucksack is straight out of my dreams.. or at least out of a Full House rerun. Jeffrey Campbell released a Lita boot with a striking creamy floral brocade pattern as well, although it's even harder to find than the standard Lita. Felted wool hats with feather details. Not to be confused with fedoras - my hatred for fedoras is nearly as strong as my hatred for animal print. Urban Outfitters has this lovely wide brimmed one, above, as well as a great floppy felted hat that's a perfect 70s throwback. Glitter oxfords. With the holidays coming up, my love for glitter and sequins is climbing. This is probably common. These glitter oxfords might be a good wear for all year round, however. Leather shorts and silk blouses. Preferably paired together. Super awesome skincare. When I was younger, I thought all skin woes would end when I turned 20 - sadly, skin blemishes don't discriminate. My sister Ashley swears by the Philosophy brand, so I'm hoping to try it out for myself soon. White linen dress form in my size. I sold the adjustable dress form I bought earlier in the year because its measurements were so far from my own that I never used it.. now, I'm looking for a standard linen dress form - something pin-able and petite that I can use when learning to drape fabric. Patterned ankle socks and ribbed modal knee highs. I love striped and floral ankle socks but when it comes to over the knee or knee highs, I like to keep them simple. If they have an interesting sweater-like texture, I'm a fan.. ribbed or cable knit. Lots of my American Apparel coworkers have been layering over the knee socks with tights, and they always look adorable. Umberto Eco books. A couple of my all-time favorite novels are Foucault's Pendulum and The Name of the Rose, both by this bearded Italian author. History of Beauty and On Ugliness are two studies he wrote that I'd love to get my hands on. Short length, long sleeved winter dresses. Sweater dresses, velvet dresses with crocheted collars, creamy lace. Maybe it's my recent love of maxi dresses that makes me go to extreme lengths with all other dresses I wear - minis and maxis and nothing in between. Rhi took a photo of that TBA lookalike velvet dress when she visited Dublin's Topshop in the fall and it became a fast favorite. Glamorous sequin party dresses. We only have a handful of truly great dress-up opportunities during the year, and New Years is one of them. These decadent Topshop dresses aren't my usual style, but I think branching out for the holidays is a good way to stretch my comfort zone. Paired with a mini brocade purse. If I'm not wearing sequins this New Years, I'll be wearing velvet. Cable knit crop sweaters and maxi dresses. One of my favorite trends of the season is the maxi sweater dress.. probably because it's so cozy and comfortable. Beaded peter pan collars. Sadly, this specific one from Topshop is out of stock. It's sad because it's perfect - an oversized, attachable collar to dress up any plain blouse or dress. I think I originally spied this one on Mademoiselle Robot's pretty blog. Deus Ex: Human Revolution. 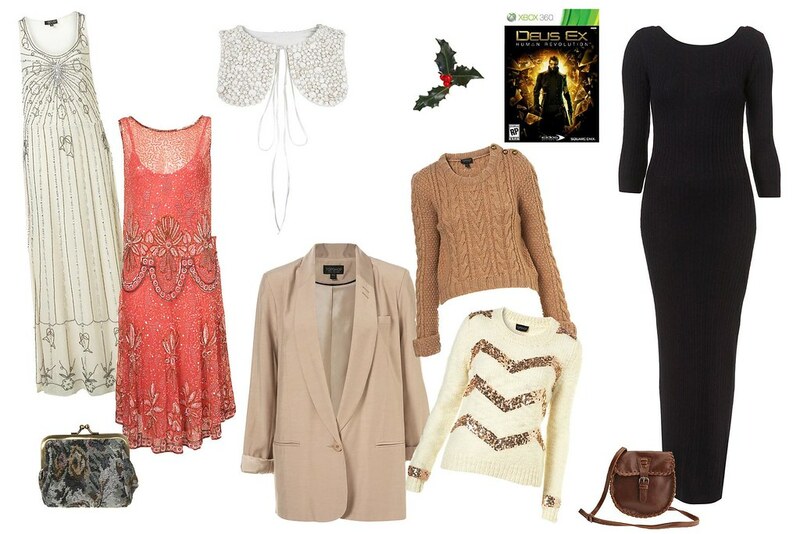 Number one on my Christmas wish list is not a four hundred dollar dress, but a video game. I played the original Deus Ex over a year ago on the advice of a friend, and its story was pretty fantastic. It explored the pros and cons of dystopian anarchy versus small, city-states government versus complete totalitarian rule, all in a futuristic Blade Runner-esque universe. I've been a sucker for politically driven conspiracy theories since I was a dorky little preteen. That's all for a rather extensive holiday wish list.. what are you wishing for this season? shop update! ladylike pleats and granny sweaters.